The arugula bolted this past week so it's done for the season. Same thing is happening with the Chinese cabbage, so we decided to harvest all thats left and give them out this week. Boc Choi is starting to go to flower now too, but not as bad. Maybe it will last for another share? Maybe not. Then the bugs that like our Japanese Turnips have come out so this is the last week for them too. 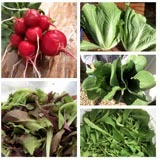 Looks like Mother Nature is tellig us she is through with cool weather crops and moving on to warmer weather veggies. It's good to see the head cabbage doing it's job, forming nice heads. I'm hoping they do so before the caterpillars come out! Head cabbage can be such a challenge, especially when growing 100's of them. It's good to see so many of our crops growing nicely on the farm with the warm weather. We did a lot of planting this past week. I got the last of all the zucchini and squash transplanted. Shain has been planting shell peas, salad, fennel, radishes, scallions, parsley, cilantro, and snap peas. If the amount of greens coming in your shares these weeks is too much for you, I recommend cooking them up stir fry method (with other veggies) and using the mixture for egg rolls. I say this every year, but I also make it every year. The original recipe is here, but I don't follow a recipe anymore. The batch I made recently was all veggie, using whatever I had on hand (ginger, garlic, onion, celery, carrots, arugula, about 7 small heads of Chinese cabbage and sesame oil). This made enough for 3 batches of egg rolls, 2 of which I froze for winter. I may just have to do it again with all the boc choi in my fridge. But Shain tells me he's going to make stir fry for dinner this week... oh, the possibilities. Isn't it nice? IMPORTANT: There will NOT be a CSA delivery next week, July 5th. The 4th of July holiday is falling conveniently at a time when our food production is a low so we decided to take advantage of the situation and take a few days off to relax a little (translation - not work as much). Happy celebrating to all of you! Recently, I've had several inquiries from folks asking if they can join our CSA. Unfortunately, we no longer have memberships for sale. Those slots sold out back before our deliveries started in May. However, we still have several openings for people who would like to help the farm in trade for a CSA membership. I explained what we are looking for in detail here. In summary, there are 3 ways the farm could use help and this is the only way someone can join our CSA this far into the season. 1. Regular Workshare - puts in work on the farm one designated day each week in exchange for a share of produce. Will mostly help with harvesting food, but also with weeding, planting, etc. 2. Yard Maintenance Workshare - puts in work on the farm each week on a more flexible schedule. Main purpose is to help with basic farm and yard maintenance, including weed whacking, mowing the lawn and areas of the farm, etc. The hours could even be completed by more than one person coming together to fill the hourly commitment (for example, a family with older responsible children). 3. A delivery person who will help transport our produce each week from Smoot or Afton to Alpine. Person must be available on Tuesday afternoons. This help will be traded for a reduced cost CSA membership or combined with help on the farm for a full membership. A very big bag of Arugula (12 oz.) This may be the last of it for the year. As I mentioned last week, it will be a while before we have salad mix again. We are guessing at least two weeks. The baby greens are about 1 inch tall right now. They got weeded last weekend and with this stretch of sunshine, they'll probably grow very well. Yeah! I look forward to baby salad greens! I posted a lenghty farm update last night with many pictures. I hope you will take the time to read it. I decided today the easiest way to give you a farm update is to take a stroll around the farm with my camera. First a quick update on our ground water situation. Our family is now back into a routine of personal activities and farm work. We still have water flowing under our basement which is kept under control with the heavy duty septic pump running full time 24/7. The inside basement floor is remaining steady at about 1/2 to 1 inch of water covering approximately 2/3 of the floor space. When the river accross the field from us rises, the water coming into our basement ususally increases a little too. But we haven't seen it go over 1 inch for about a week. Meanwhile, we still aren't able to use any of the conveniences that go along with a septic system. No toilets, no showers, no hot water, nothing down any of the drains. I'm VERY glad to have electricity and running water! I'm also thankful for the port-a-potie, though not necessarily enjoying the process of using it. Home to our first crop of cabbages and second planting of Japanese Turnips and Arugula. Left to right: pac choi, head cabbages, a half empty row where the Chinese Cabbage was, Japanese Turnips, and two rows of Arugula. The pac choi has taken off nicely and formed some very nice large heads. The cabbages are finally starting to head up. Turnips are ready to harvest and we are hoping the weavels don't get them before they go in your shares. The aurugula is big now, almost too big, and has started to bolt. We cut a lot of it today, which is hard to see in this picture. We don't think it will make it to next week, though we'll wait to see how it takes this week of warmer weather. Flea beetles are coming out now too and this is their favorite! Just last week this greenhouse was full of old arugula and salad greens. The second line in from the left was a row of Japanese Turnips which we took out completely for this week's CSA shares. This greenhouse has now been planted with French fillet beans and zucchini. We've had troubles getting a good crop of zucchini and squash the past two years (due to the cooler weather) and decided to bring them inside this year. Squash and zucchini have a tendency to grow out-of-control-huge inside greenhouses, but we put these down the middle for maximum ventilation and are hoping for the best. From left to right: Swiss Chard, two rows of beets, kale, cauliflower & brocolli (growing in holes through black plastic weed block), pac choi/Chinese cabbage, and two rows of carrots. This greenhouse is turning out to be very helpful after all. It's a lot of space to grow a lot of food and we would be in an entirely different situation this year trying to grow produce in the cold and rain without it. Unfortunately it looks like the Chinese cabbage wants to bolt so we'll probably end up harvesting that early as smaller heads. Otherwise, all is well in greenhouse #3. We try every year to have tomaotes to sell at the very first farmers market or at least sometime in July. As you can see, it's not going to happen this year. We started these 21 tomato plants very early, grew them under wall-o-waters, even used a heater inside the greenhouse to get them outside and growing as soon as possible. This goes to show that sometimes no matter how early you plant some crops, they will not grow until the conditions are right (enough sunlight and warmer weather). I think the tallest tomato plants are only 1 ft. tall. We will continue to cover them every night for another week or so, until the night temperatures are in the 40's on a regular basis. Left to right: seedling trays with many of our herbs and other "back-up" plants. Then rows of tomatoes, peppers, and cucumbers. The basil will be transplanted in here eventually too. This is our main crop of tomato plants and they are nearly as big as the first crop. Again, this is a great example of how weather is the real factor in plant growth. We often see a second crop be ready nearly the same time as plants we put in a few weeks earlier. One good thing to note is that the rodents mostly left all these plants alone. They did very little damage in any of the greenhouses this year. My favorite greenhouse right now because it is so beautiful to look at. We've weeded it several times and it has really paid off. Left to right: several rows of carrots, onions, and beets (golden and red). I wish all our farm looked this nice. I'm pretty sure I talked quite a bit last year about our nemisis weed - thistle. It's quite a headache for us. We've tried torching it, spraying it with an organic weed spray, and digging it (over and over and over again). Thistle is a very invasive and stubborn week. The only method we've found to be even semi-successful at beating it is to smother it completely with thick black plastic. This is a section of field 1, larger than the size of most people's entire garden. We decided it wasn't even worth planting this year due to the thistle. There are several more patches throughout the farm that could use this treatment. These rows are planted with yellow onions, a few shallots, and leeks. I mentioned before that our supplier for leek starts had a crop failure and we were unable to find a substitute. These leeks are planted directly from seed. They are tiny. I wonder if they will ever get bigger than scallions. Even then, we'll enjoy the taste. This is a new trial for us, so we'll just have to wait and see what happens. This year we divided our largest field into two smaller and more manageable sections, now know as fields 3 & 4. (Are keeping track of all this?) This section is planted with our yukon gold poatoes. They are planted under a thin black plastic for weed block. Using weed block is a new for us this year and we are hoping it cuts back considerably on labor. I welcome anything to help cut back on the weeding. This is now our largest field, which we only started clearing to plant a few years ago. It's got a lot of rocks and weeds, but over time we'll get it in shape. So far this year, we have this field planted (left to right) with our new garlic, a first row of peas, spinach (under cover), our first crop of outdoor salad and then our second crop of outdoor salad. Thanks to a few days of intense weeding, these greens should grow nicely now. They'd be ready even sooner with some days of sunshine. We got out little piglets this past week. They are already eating well from what we pulled up in greenhouse #2. The little piggies don't know how good they have it here. We take good care of them and in return they make us a very nice pile of compost. Oh, and we eat them too. This is our first batch of meat chicks for the year. They are pretty cute, for now. We plan on raising three batches of meat birds over the coming months. Meat birds are a good match for our farm. When they are older, we will move them to chicken tractors. These birds will help us clear our fields of older crops, weeds, and bugs and be eating very well all the while. They will be slaughtered and sold around the first week of August. More to come on that later. My goats are also living a good life. The three spring babies are growing quickly. This mama goat is keeping her triplets fed well which is quite an accomlishment. The two kids in this picture have been sold to a farm in Utah. They'll leave in the middle of July. The third buckling is yet to be sold, but will probably also leave the farm around that time. We really enjoy their company while they are here. There you have it. A virtual tour of the farm. Salad Mix - this will be our last harvest from the first crop we planted in greenhouse #2. The first outside crop is still a week or two away from being ready, so saver this last bag you'll be getting for a while. Also, you'll notice this "mix" is missing some of the salad varities we usually include. That is because the mizzuna bolted and the red salad bowl was looking pretty bad. This may be a good time to try adding some arugula to your salads (if you haven't already) or maybe some of the other greens. Arugula - it's still doing well (no bugs, not bolting) due to cooler weather. Hoping to get another harvest next week. Radishes - pulled up the last of the early radishes we planted in greenhouse #2. There are more planted outside. Japanese Turnips - also still doing well. Chinese Cabbage - finally getting some larger heads of cabbage. In order to get enough for everyone we also harvest several smaller heads and double them up in the shares to compensate for their size. This will also be the last of our first batch of Chinese cabbage (from greenhouse #1). The second crop is growing nicely in greenhouse #3 but won't be ready for a few weeks. Next week we anticipate giving out a nice share of pac choi to everyone. We transplanted our peppers today. They get a row down the middle of "the big tomato greenhouse" (#5). They've done so well in there the past few years that we know this is where they belong. As we've been pulling up and cutting down the last of several early season crops, it is making room for us to plant a second batch of crops in the much valued greenhouse space. We'll be planting beans and squash this coming week in the newly emptied rows. It's been very hectic at our home since last Wednesday. Our basement flooded and we've been overwhelmed with the work it takes to clear out our personal belongings as well as deal with the incoming water. Thankfully, we didn't loose much because of a quick response by many neighbors who came and lifted everything a foot or more out of the rising water. We are just about a week out of this situation and still have an inch of water flowing through the basement with a heavy duty pump running full time. We jokingly say there is a river running under our home, only it's not a joke. Everything is a mess around here, but we are healthy and coping. We have received help, meals, and other kind acts from many great people. We will get through this. Please forgive us for being distracted from the farm which is usually our first priority this time of year. We would like to inform you that we had our wells tested for possible contamination and the results came back negative. Our water is safe and clean! This farm is still in business! :: Potatoes were planted (over 400 pounds) last Thursday, Friday and Saturday. We are trying a new method of planting them under black plastic to block out weeds. It took more time upfront to plant, but we are hoping it saves a lot of time later on with weeding. :: Cauliflower transplants are in. Again using black plastic mulch. :: Shain recently planted more salad mix and spinach. :: The pig pens have been cleaned out making a new compost pile that will eventually be spread in the greenhouses or on the fields. New piggies will be here soon (they are all spoken for before even arriving at the farm this year). :: We are still experiencing crazy weather here. One night the temperature forecast was for 29 degrees so we had to take precautions and cover sensitive crops in the greenhouses. That very next day the temperature in greenhouse #5 (with all the seedling starts and newly transplanted tomatoes and cucumbers) had shot up to over 100 degrees! Shain scrambled to install our greenhouse fans but unfortunately we lost a few plants. Good thing we keep "back up" replacement plants. I know my food photos aren't the best, but I like to share some of the meals we have been making with our veggies. This is a soup Shain made for lunch yesterday with our turnip greens. It's a variation of our Potato, Bacon and Kale Soup Recipe. Actually, this is quite a healthier variation from the original recipe. (Shain likes to make things up as he goes along.) 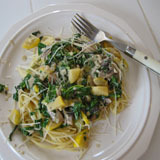 If you are making anything yummy from your CSA share, please send us a recipe (and pictures) to share with the group. Have a great day and ENJOY your veggies.